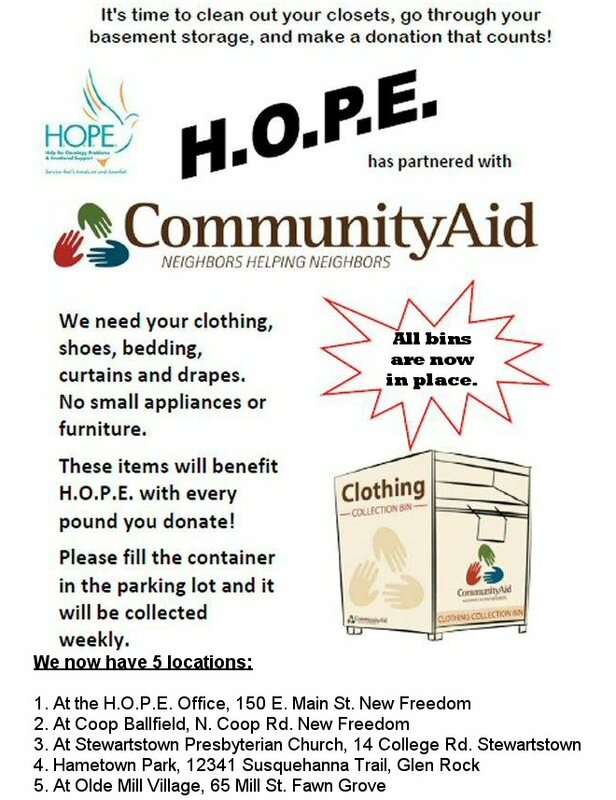 Community Aid Bins located in the area to support H.O.P.E. It’s time to clean out your closets! Go through your basement, storage and attics, and make a donation that counts! Besides the Community Aid bin already located at the office, we now have 4 more bins placed in the area. One in the Hametown Park, 12341 Susquehanna Trail, Glen Rock. Another in Stewartstown at the Stewartstown Presbyterian Church, 14 College Ave. And another at Coop Park at N. Coop Rd. New Freedom. The last one is located at Olde Mill Village, 65 Mill St. in Fawn Grove. Please keep H.O.P.E. in mind when you are cleaning out those closets this winter!